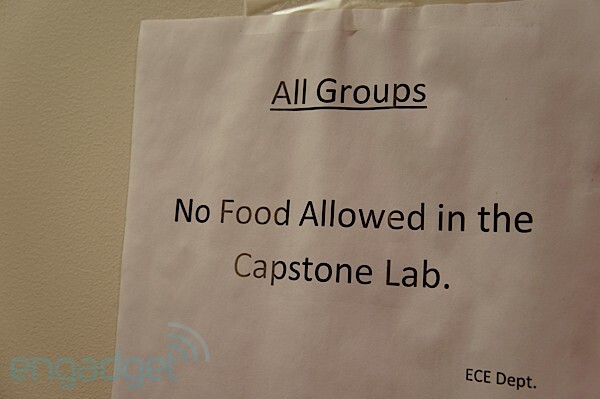 We're back for another day of exploring the Northeastern University labs. We checked out a handful of projects yesterday, including the HyCycle, a runner-up in the school's Capstone award. Today we checked out the winner: iCRAFT -- that's short for eye-Controlled Robotic Arm Feeding Technology. The project was developed by a group of seven electrical and computer engineering students looking to create an inexpensive solution for helping the disabled and elderly feed themselves at home. As the Apple-esque name implies, the project utilizes eye-tracking to help the user feed him or herself. The hardware side of the project involves a robotic arm and controller (which run a combined $640), a hacked Creative webcam and IR light (around $114), three bowls, a water bottle and a custom built power supply. 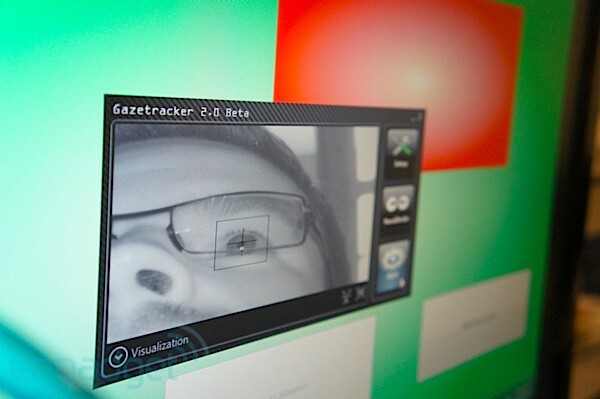 On the software side, the team used the open-source ITU gaze tracker software, combined with a custom GUI. The whole thing is designed to be simple to use right out of the box -- though, being in prototype stage, there were naturally a few hiccups in the process. It didn't work perfectly when we demoed it today, but it certainly wasn't much more buggy than what many companies try to pass off as finished products. The whole setup worked pretty well off the bat. We sat down, let the system calibrate for our eyes (which managed to track our gaze through a pair of glasses), a reasonably quick process. Once calibrated, the team's simple GUI pops up on the monitor, featuring four big blocks: a yellow bowl one, a blue bowl two and a red bowl three. Along the bottom is a big green rectangle labeled "Rest." The crosshair that signifies what you're looking at has a tendency to jump around and can be slightly distracting, but after just a few minutes we were able to get the hang of directing the pointer to the desired location. We found that picking blocks one or three on either end of the screen was actually easier if we looked past the monitor's bezel. Once you've locked in and stare at one block long enough for the indicator gradient to fill up, the arm goes into action. Is swings the plastic spoon at its end toward the chosen bowl, lifting up and plunging into the food. According to the students, the system has a "scooping algorithm," which ensures that it evenly distributes its position, so you get the whole bowl's contents for more clingy food like rice or cook oatmeal. The arm then slowly raises the food-filled spoon, bringing it around and then gingerly moving it toward the user's face. Once extended, new options appear on the screen, allowing the user to return the food to the bowl (in the case of a changed mind or wrong selection) or to get a drink from the Hydrant Bottle. One issue we encountered here, was that the arm, once extended, would sometimes interfere with the eye tracking, making it difficult to select a new option, but the team assured us a higher-end camera or a more optimal positioning could easily rectify the problem. All told, the system cost the students about $900 to put together. Mass produced, they expect that price to drop down to around $800 to $850 -- that's a pretty big drop from the $3,500 to $6,000 that similar systems often cost. But while the system is designed to work instantly, it's certainly not a complete replacement for human help. After all, someone still has to cut up the food and put the bowls out. Rather, the system is meant to simplify the process and offer a greater degree of freedom and control over the act of eating.